Issue #28, Wednesday September 06, 1995. Tessellation Times #528 – newsletter for AutoDesk 3-D Studio. simpler to prepare and maintain. inhouse or could assemble in short order if there was nothing else to do. that we'll have to deliver in ounces and pounds here and there. Walk: Artists' Home Pages" to go active on our home page. Sept. 12-14, San Francisco, Calif.: 8th Multimedia Expo West, Moscone Ctr. (ISEA '95). 514/990-0229, 842-7459 fax; . Jeff Reisner at or 813/595-7263. held by local dealer Synergis Technologies, 215/529-9900 x114, 536-9249 fax. Convention Ctr. 800/800-5474; 914/328-9157, -2020 fax. France; 33/1-49-83-26-93, -31-85 fax; . simplicity; editability; diversity of applications; and extensibility." some of the Internet community spirit that has fueled interest in VRML. Graphics; Jan Hardenbergh, Oki Advanced Products; Jon Marbry, Microsoft; Dr.
Inc.; Tony Parisi, Intervista Software; and Mark Pesce, co-inventor of VRML. lists its other constituent programs without mentioning Painter.--B.A. for Windows, is going to get _animation_! into 3D animation (assuming the hardware is available). tailoring RD Studio to specific customers' needs. 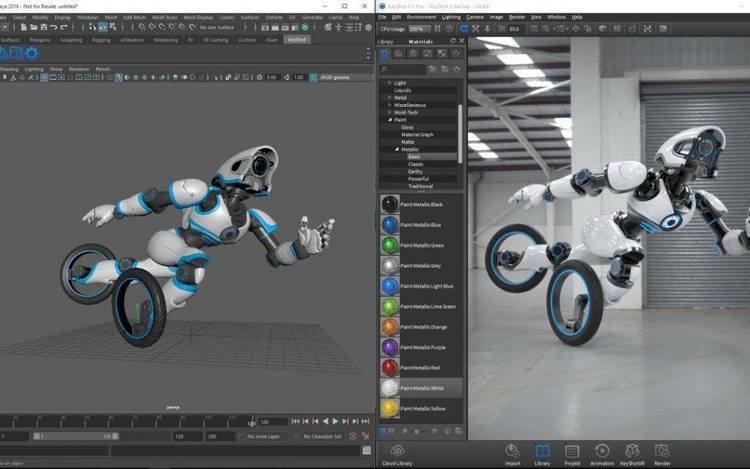 expect for current cross-platform software, no other QuickDraw 3D features. are today. Each print comes through in minutes, in 4x5" to 8x10" sizes. Input is from a series of Targas like we described in *3D Artist* #20.
should finally move 3D Studio into raytracing and radiosity solutions. application programming interfaces (APIs) such as OpenGL and QuickDraw 3D. than the 3DS Max rollout where it first appeared. drivers will ship with Max and should work with "any Glint-based board,"
presumably including Creative Lab's new $350-range 3D Blaster. character animation users and applications." protection that locks all plug-ins to a user's single 3DS Max dongle. Support for multiple CPUs through "extensive" multithreading. The Valis Group announced a 1.6 version update for Pixel Putty Solo ($399). include motion capture, better flex settings control, and improved welding. 1.2 to 1.6 is $200. Pricing from 1.5 to 1.6 is $65.--A.K. and, of all things in polygonal modeling, refraction mapping. $995 continues as the introductory offer. Schreiber) was demo'ing their new Sculptor NURBS modeler for 3D Studio r4. you have a story to tell and know how to tell it. entertainment footage produced on a workstation. together for only six days every year. getting an interactive project beyond the "wouldn't it be great if..."
comprehensively covers all the check points for development and production. code and images found in the original texts. surfaces, raytracing, radiosity, halftoning, and image processing. casting techniques are given detailed discussion. forums, games, special interest groups, etc. titles that sound like they would be of help. easy viewing and lookup with keywords and information for every image. authors. Heinz Schuller and Jim Lammers are the two latest. along with Michael Todd Peterson. It includes a CD-ROM and hands-on tutorials. versions on the accompanying CD-ROM. $40). Some early examples and applications come on the bundled CD-ROM. Access Web site at http://nctweb.com/nct/wca.html. judging from *D-3*, 3D is definitely what's hot for power gamers. the frame rate on Pong? San Francisco, CA 94112; 908/549-5448. support in DOS for Sound Blaster and in Windows for all Windows sound cards. playback at 30fps without hardware acceleration. seminars for September in Los Angeles. Strata StudioPro, and Electric Image, Sept. 14, 7-10pm, tuition $60. explores the fundamentals of how to create animations using Studio Pro. within 3D Studio which "will leave your head spinning with possibilities." Tuition is $200 for Sept. 26-27, 10am-5pm. Los Angeles, CA 90027; 800/999-4234; 213/856-7690. multiple CPUs to help leverage such a large investment in RAM. we reported in *Tess*#525.01, the stated minimum system will be a "fast 486"
liveable for your current 3D Studio usage?*--B.A. ftp://avalon.viewpoint.com) model repository had been acquired by Viewpoint. time) which should help even more. Story* will be Disney's 1995 Holiday release. rendering tools for Unix and NT platforms. from your use and feedback on our products and we appreciate your loyalty. (surface mail postpaid worldwide) from the address in DETAILS above.